A Drink Coaster Company for the Beverage Lover! We specialize in making unique drink coasters with everything from music, food, to even theme parks. All vintage, handmade and made to order! We will even take your own photos and create a set of coasters for you too! Stop the dreaded water stain. Buy these coasters and save the coffee tables of the world! I love a guy on a mission! I ordered a set of the 1971 Magic Kingdom park map coasters. Let me be honest, when I opened them, I actually squealed a little bit. They are fantastic! The coasters, made from tile, resin and felt foam are beautiful and sturdy. The foam backs won’t cause damage to a table and the resin tops won’t ever have issues with drinks. My husband looked at them and asked if they would scratch our table. I showed them that with felt on the back, they are perfectly safe to use, even on glass. I got to talking with the Coaster Guy about his creations. He and I are both so certain that our readers will love these coasters that he designed a set especially for WDW Hints! 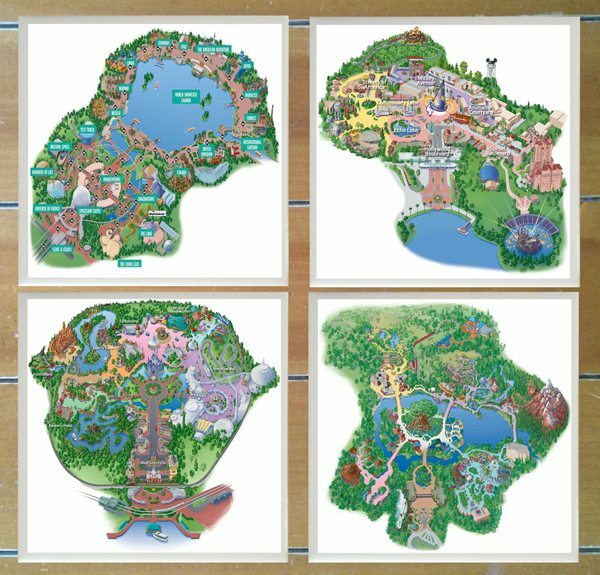 This theme park map set features maps from all four parks. Even better than that, we’re giving a set away! The Coaster Guy is also offering $2 off for our readers! Use the code WDWHints to receive $2 off your coaster order. We, of course, recommend them. I highly recommend these coasters for any Disney fan. Enter to win a Parks Map Coaster set using the Rafflecopter below! Giveaway begins Monday, April 6 and ends at 11:59 p.m. (eastern) on Monday, April 13 (2015). Must be at least 18 years of age to enter and a resident of the USA. Winner will be notified by email and have 48 hours to claim their prize. Previous PostTry Purex® Crystals ScentSplash™! Next PostDisney's Youth Education Series ~ A Best-Kept Secret!